AutoZone is the second-largest retailer of automotive parts and accessories in the United States. It is committed in providing the best automotive parts, prices and excellent customer service in the automotive industry. AutoZone was founded in 1979 by J.R. “Pitt” Hyde III, who saw the need for retail automotive parts store. Part of the company’s pledge is to always put customers first in which they go the extra mile to ensure that their customers are getting what they need. AutoZone has more than 5,200 stores across the United States, Brazil and Mexico. The company’s headquarters is located in Memphis, Tennessee, U.S.A.
AutoZone started when J.R. “Pitt” Hyde III received his bachelor’s degree in economics at the University of North Carolina, and joined Malone & Hyde, Inc., a wholesale food company that distributes food products to independent grocers. Pitt developed Malone & Hyde’s retailing division, which he started as drug stores and expanded to include sporting goods stores. He saw the need for the retail automotive parts stores, so created Auto Shack in 1979, and the first store was opened in Forrest City, Arkansas. Pitt served as the Chairman and CEO of Auto Shack back then. In 1981, Auto Shack opened their Express Parts Service warehouse in Memphis, Tennessee to allow their customers to order hard to find parts. The company became the first auto parts retailer to create a quality control program in 1984. In 1987, the name Auto Shack changed its name to AutoZone, and in the same year they introduced the first electronic catalog in the industry. The company began trading on the New York Stock Exchange in 1991. By 1995, the company opened their 1,000th store in Louisville, Kentucky. Pitt retired as Chairman and CEO in 1996 and was taken over by John Adams as the new Chairman and CEO. The company’s first store outside U.S. opens in Nuevo Laredo, Mexico in 1998. In 2001, Steve Odland became the third Chairman, President and CEO of the company. AutoZone founder Mr. Pitt Hyde accepted the Automotive Hall of Fame for setting a standard as the first aftermath retailer in the Automotive Hall of Fame. In 2005, William C. Rhodes III announced as the fourth Chairman, President and CEO of the company. In 2007, they opened their 4,000th store in Houston, Texas and the first AutoZone store opens in Alaska making it as their 5,000th store in 2012. In the same year, AutoZone opened their first store in Brazil. You will maintain the inventory and quality control programs within the department. You will analyze sales, credits and receiving for possible problems and provide tools or techniques to improve quality and efficiency of the Distribution Center. You will be responsible for the daily operation of multiple DC Departments. You will provide guidance and leadership to distribution center managers to ensure that the overall goal of the department is being accomplished. You will be responsible for performing moderate to complex duties, particularly in researching, designing and developing methods and materials to increase operational efficiency and to utilize distribution facilities. You will be driving an 18-wheel semi from the Distribution Center to other locations within the area serviced. Loading and unloading pallets averaging 1,200 pounds at AutoZone Stores using an electric pallet jack. AutoZone is actively looking for talented individuals by providing a Summer Internship program for those who want to be a part of the company. As an Intern, you will gain on-the-job experience while getting an introduction of the company. 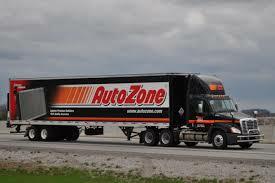 AutoZone also takes a visit for certain colleges and universities to look for qualified individuals. AutoZone also partnered with technical colleges across the states, to provide the company with great personnel that will contribute automotive knowledge and technical expertise to the company.